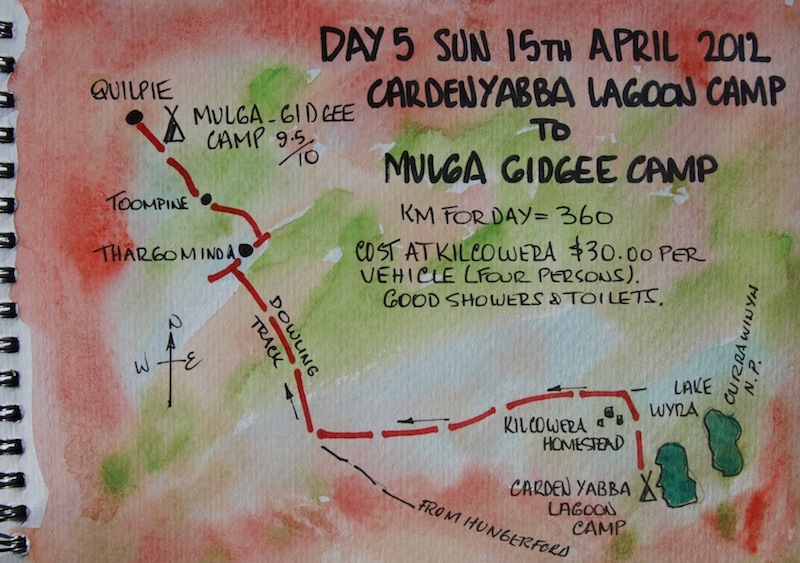 Reluctantly this morning we left Kilcowera and headed for Thargomindah, took on fuel and decided to press on towards Quilpie. On the way out of town we called into the rodeo grounds looking for a couple of locals we knew. We didn’t find them but we did meet with a couple of interesting characters, Mumma and Papa Yobbo. They have a mobile coffee van serving ‘real’ coffee to people in the outback including the spectators at today’s camp draft competition. I asked Mumma Yobbo where they were going next and she replied Darwin then to the Pilbara in NW Western Australia. They have a contract with a mining company to provide coffee to workers for some special functions. Bev asked Mumma Yobbo where was home. The reply was, ‘Right here, where I’m standing’. 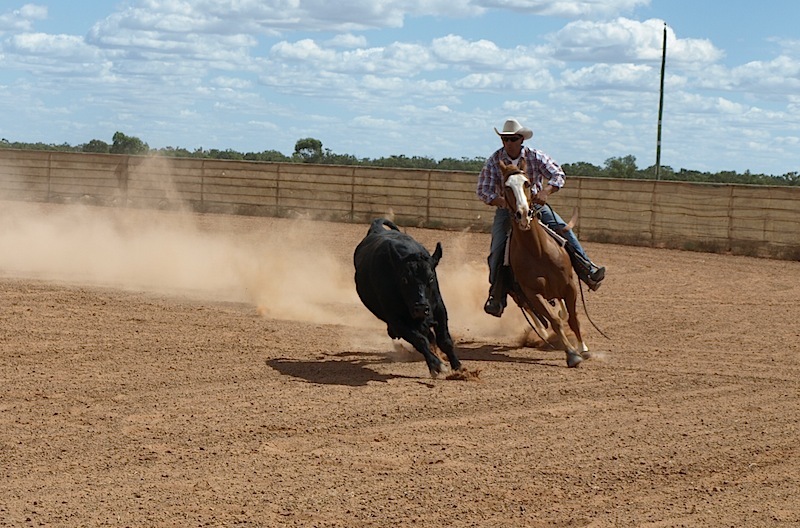 Camp drafting is something I know very little about but after talking to a couple of locals I realise it is a very big business and a high status activity. Horses are worth tens of thousands of dollars and the competition is fierce. 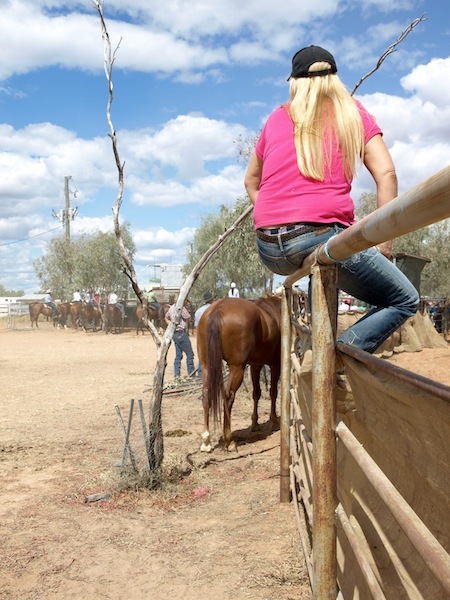 I think for camp draft spectators it’s all about sitting on fences. I think, for camp draft participants, it’s all about the horse and rider getting the cow where they want it. On the outskirts of Thargomindah is the old town artesian bore head. Water still comes to the surface under pressure, which is nothing unusual for an artesian bore but the one here is different. Thargomindah was the first town in Australia to utilise the natural pressure from the bore to generate power. The plant supplied the needs of the town from 1898 to 1951 when the town went diesel. The generating plant is still operational but only as a demonstration attraction for tourists. According to the tourist blurb the present set-up is believed to be the oldest, working unit in Australia and possibly in the world. Water from artesian bores is discharged into bore drains such as this. 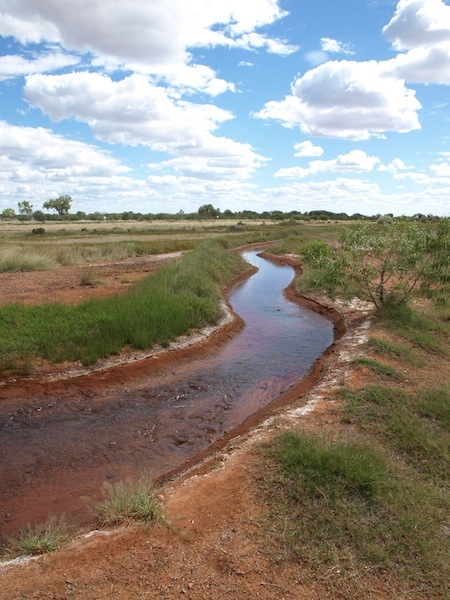 They criss-crossed pastoral lands all over the Australian outback providing stock with drinking water. The system was cheap; the only cost was ‘delving’ (cleaning out) the drains occasionally. No need for piping, tanks or troughs. However this system wasted a lot of water through soakage and evaporation so now most free-flowing bores have been capped and regulated. 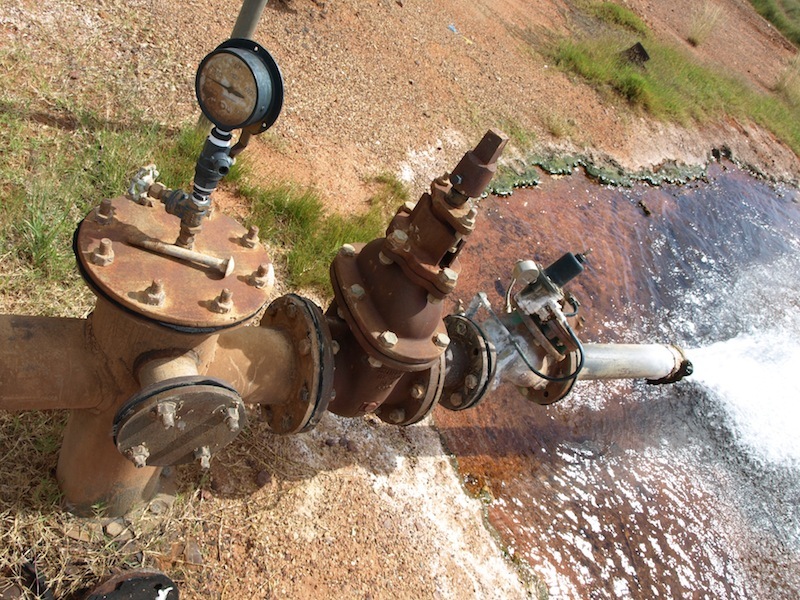 The Great Artesian Basin provides the only reliable source of fresh water through much of inland Australia. The basin is the largest and deepest artesian basin in the world, stretching over a total of 1,711,000 square kilometres (661,000 sq mi), with bore head temperatures ranging from 30°C to 100°C. It underlies 23% of the continent, including most of Queensland, the south-east corner of the Northern Territory, the north-east part of South Australia, and northern New South Wales. Water in the basin is 3,000 metres (9,800 ft) down in places. There is evidence to suggest that waters gushing to the surface today fell as rain millions of years ago. The word ‘artesian’ pertains to Artois in France where similar bores to the ones in Australia were found. Having a hot artesian bore on your property not only provides cheap water but also provides hot water for luxurious outdoor bathing. Some towns like Lightning Ridge, Burren Junction, Pilliga, Moree and Mitchell make use of the hot flowing waters as a tourist attraction. People migrate from all over to bathe in waters said to be very beneficial to the health. Bev and I prefer the bush setups on properties like the one here showing two of our Swiss friends enjoying a dip. From Thargomindah we pushed on north, stopping at the Toompine pub for refreshments, a yarn and to top up our water drums with rainwater. During Backtrack touring days we made it our business to know where rainwater tanks were and Toompine was one of the watering spots. The pub once boasted the smallest bar of any in Australia but a few years ago it was doubled in size; it’s now about three metres long, which is still pretty small. 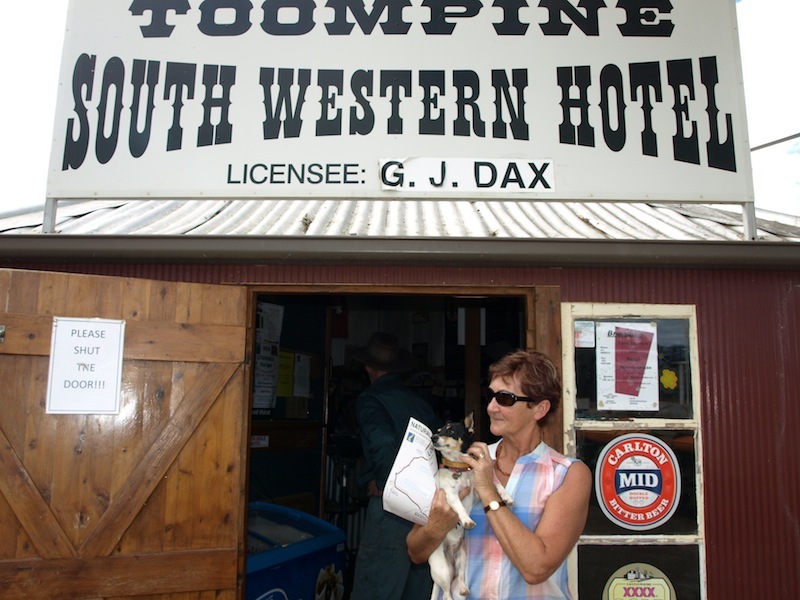 Toompine is a social centre for the surrounding property owners and local opal miners. The town derives its name from the Aboriginal word ‘Thempin’ meaning a leech. The Toompine Hotel (circa 1893) is known as the ‘pub with no town’ for the population is now two – presumably the licensees of the pub. Close to the pub is the ‘cemery’ (not cemetery) in which there are ten graves. Only three of these have headstones. Two of the marked ones are those of young children. One of the children died from gastroenteritis and the other from strychnine poisoning. The strychnine poisoning tragedy was a result of the young lad playing on kangaroo skins that had been treated with arsenic. The sister of this young lad travelled to Toompine some years later and found the graveyard in disrepair. 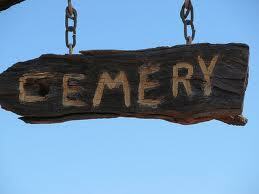 She carved a sign ‘Cemery’ in a piece of Mulga to mark the graveyard. Quilpie Shire Council has since fenced the cemetery and has used the sign to mark the entrance. In country Australia cemeteries are quite often found in close proximity to hotels because they were usually the communication/contact centre for the region. If locals were sick they went to the hotel, took a room and waited for a doctor or nurse to come from a larger town. Sometimes the ill patient died before the doctor arrived so it was out the back door and across the paddock with the deceased where the burial took place. 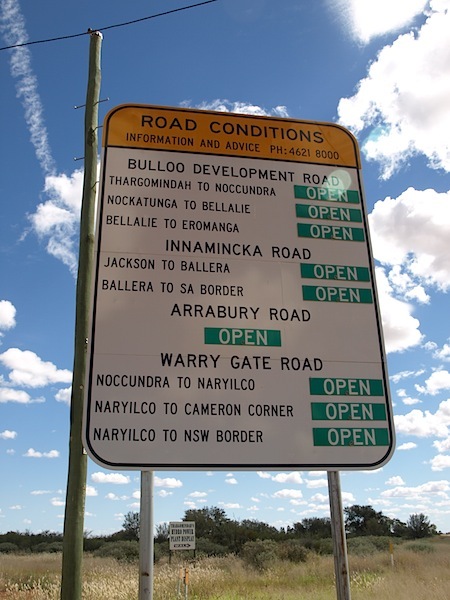 There is one tragic tale relating to the death of a bullocky in central Queensland. A bullocky was bitten by a scorpion and he held up at an inn whilst a patron rode to the nearest town (about two hours ride away) to fetch a doctor. The doctor wouldn’t travel out to the pub until he was paid so the rider went back to the pub, took up a collection and rode back to the doctor. Upon receiving the money the doctor went to the inn but the bullocky had died. It seemed the doctor kept the money. This story is inscribed on the bullocky’s headstone adjacent to where the inn once stood. Inns, pubs and hotels were more than places for vittles and grog. Visiting coroners did autopsies at the pub and some state authorities required a room to be set aside for the purpose. In 1995 during our first visit to the Toompine area I was told a story about a local opal miner ‘Jimmy Halfprice’ who used to sell his opals to passing travellers watering at the Toompine pub. His name related to the fact he would sell the first customer he encountered a valuable opal for half price, they in turn would boast to their friends about how cheap his opals were. Jimmy’s trick was to sell rubbish opal to them, subsequently making a sizeable profit. Jimmy used to drink in the pub every Friday night and after one occasion, his last in fact, he went home to his opal field humpy feeling a little worse for wear, took some of his wife’s medication by mistake and died. Jimmy’s mates decided to take him to Quilpie and bury him. First they went to the police station but there was no one on duty, next they went to the local vicar but he was not around so they took Jimmy to the cemetery and buried him themselves, along with all his opals. This story was related to me by the late Donny, an opal miner at the nearby Yowah opal fields. Donny had many such stories to tell and at some time in the future I will find an excuse to tell you more. 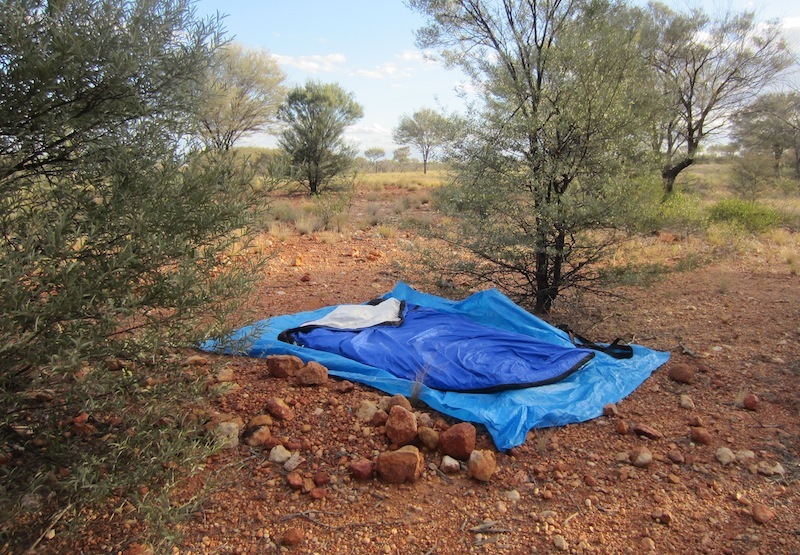 The search for a free bush camp began about fifty kilometres north of Toompine. 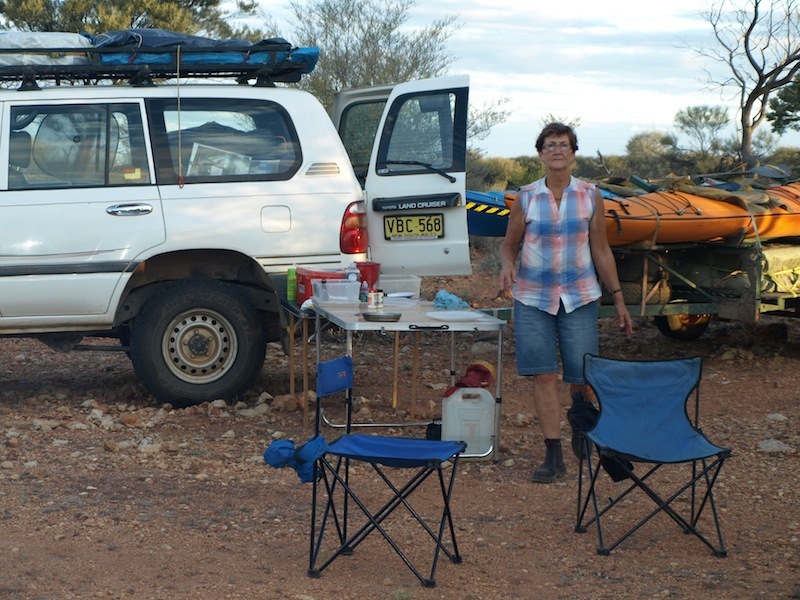 After a couple of false starts we found a side-track to one of the most pleasing free bush campsites we have ever had in the forty years Bev and I have been travelling together. So desirable is it that I have given it 9.9 out of 10 on the Hillier arid camp scale. The campsite, which I will call the Mulga Gidgee camp, is on a quartz/silcrete ridge to the south of Quilpie overlooking a vast plain that extends to the Never Never. Country like this has a mysteriously ancient ambience about it and we certainly felt some of this at the camp. At day’s end when on the road there are a number of factors to consider as far as I’m concerned when looking for a free roadside bush camp. The first and most important is security: we need to be off the road sufficiently so that our vehicle, campfire and camp light cannot be seen from the road as we do not relish unexpected visitors. Another factor of utmost importance is to consider the campfire: is it likely to start a bushfire? This year the fire aspect is of major importance because all of the back country has had record breaking rains and as a result grasses are knee high and browning off. A final consideration is the trespass aspect: even though we try to camp within the road reserve we often find ourselves unintentionally on private land. On the odd occasion we have been approached by a landholder after setting up camp, I simply say that we needed to stop and tell him how beautiful the country is and, ‘I hope you don’t mind, we will move on if you wish’. 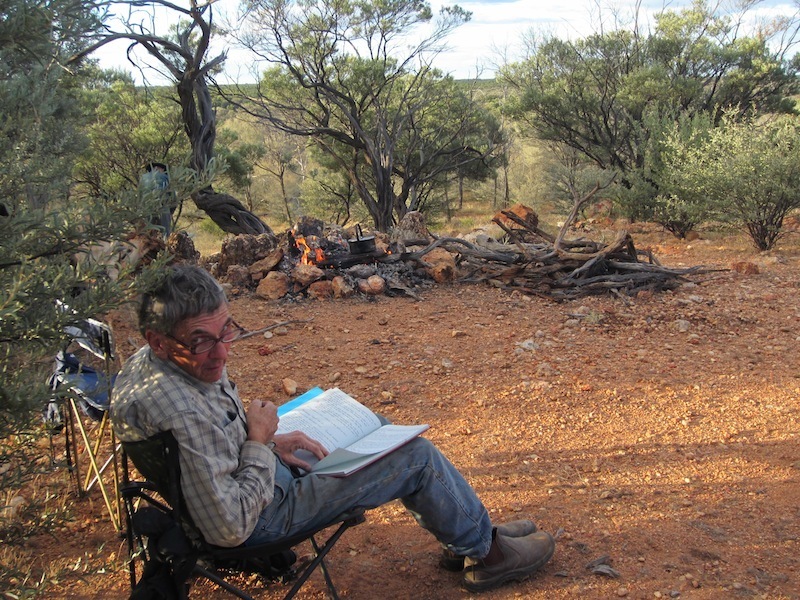 To help the landholder make a favourable decision it is important to have a tidy camp, don’t have a bottle of beer in hand, remove your sunglasses so you can make eye contact and, most importantly, make sure the campfire is small to allay landowners’ concerns as far as fire is concerned. Setting up camp. Note the mod cons compared to our 1972 camp in Greece. 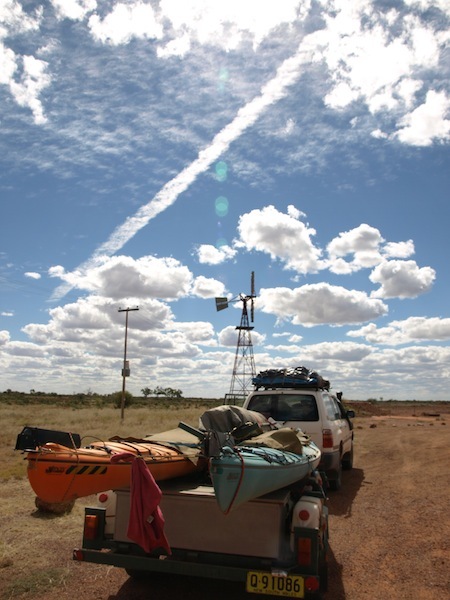 Most outback travellers use a canvas swag, which I think is bulky and unwieldy. Our swag, instead of being canvas is made from Goretex, which is lightweight, waterproof, breathes more efficiently than canvas and rolls into a smaller bundle. Primarily we bought it for sleeping in when backpacking in the wilds of New Zealand. Unless there is rain pending or there are a million mozzies about we always sleep under the stars. The Gidgee I refer to here is Acacia cambagei. Its common name is Stinking Gidgee. Its leaves, bark and litter produce an odour, vaguely reminiscent of boiled cabbage or dog manure. I don’t think it is that unpleasant though. Over the years of experiencing this odour it seems perhaps we may have become immune to it! Tonight’s camp is one of those places where we could quite easily have stayed a while, getting to know the locals (birds, animals, trees, grasses, rocks and anything else that came along). Travel is more than just seeing the sights. It’s about tuning in to the feelings of those around you.